The Royal Ballet’s first mixed programme of 2016 brings together two classic works by Frederick Ashton. Absent for 30 years before its revival earlier this Season, The Two Pigeons is a tender romance, while the abstract Rhapsody is a dazzling display of virtuoso dancing. Together they form a vibrant celebration of the talents of The Royal Ballet’s Founder Choreographer. When the great Russian dancer Mikhail Baryshnikov agreed to perform as a guest with The Royal Ballet in 1980, he requested a new work by Ashton. The resultant piece marvellously unites the bravura Russian style for which Baryshnikov was renowned with Ashton’s own, English sensibility, as embodied by Lesley Collier, who created the lead female role. Rhapsody has been a firm favourite ever since. This revival uses Ashton’s original set designs, along with original costume designs by William Chappell – not seen on the Royal Opera House stage since 1995. As ever with Ashton, the dance and the music work seamlessly together. Ashton’s brilliant choreography sets Rachmaninoff’s Rhapsody on a Theme of Paganini for piano and orchestra, itself a brilliant demonstration of virtuoso talent – its first piano soloist was the composer himself. A Young Man unsuccessfully attempts to paint his lover, but finds himself drawn towards a wild Gypsy Girl. He follows her back to her camp, but things soon take a turn for the worse. Will love find a way? 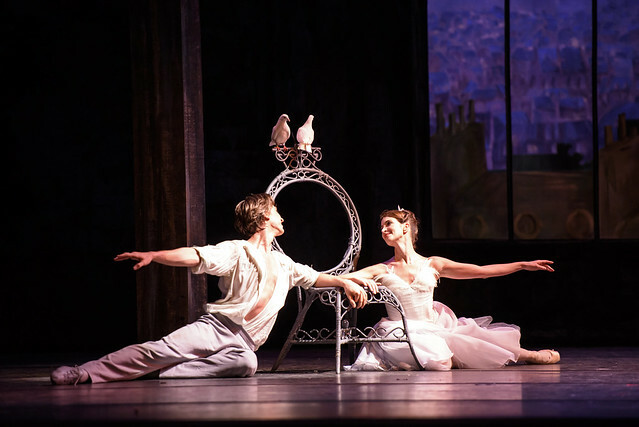 First performed alongside Monotones I and II earlier this Season, this ballet marks the first occasion since 1985 that The Royal Ballet has been joined onstage by two pigeons. The birds mirror the story of the young lovers in Ashton’s touching tale set to music by Messager. Its return this Season was long awaited: according to Director of The Royal Ballet Kevin O’Hare, of all Ashton’s works, The Two Pigeons is the one he has most often been asked to revive. Would be DELIGHTED if Rhapsody finally came out on DVD. One keeps reading of how spectacular it is - and yet it has never been recorded, as far as I know. Is there any chance of it? Why, when this ballet was performed in the recently, is it being repeated so soon? Is this a cunning new programming plan to pad out the shows? I see "Within the Golden Hour" listed in the next booking period - that sounds familiar? Like Two Pigeons the rest of the programme has been switched but I do feel rather short changed. I accept that where mixed programmes are concerned there will be repeats but at this frequency? It’s not new in the history of The Royal Ballet for productions to be repeated within a Season. Artistically it can be interesting to see a ballet framed within different programmes, and there is the opportunity for both audiences and dancers to become more familiar with the work, particularly relevant with a major revival like The Two Pigeons or a UK premiere like Within the Golden Hour. There are also practical considerations for the dancers. The programme across the whole Season is very full and rehearsal time for new work is a demanding component of the schedule which can be offset by the inclusion of works recently performed by the dancers.